The hedgehog collects the apples of my mother tongue. He is a dormant god. I take him as my wealth. The hedgehog hunts serpents and hidden thoughts. He protects against evil. Parcels eternity into spiny planets. Each mystery rolls into itself, a thorny crown rolled into a lotus. Leaving, I do not go with empty hands. I carry needles. Violins, stigmas, mulberry seeds. Each thorn a voice of an ancestor. I wear him as a brooch on my shawl. Thorny sun, a fire. For he is the god of suffering under spines. God blessed him with autism. For he is a Kipod, a beast of tricks. Defender against serpents and Isidore of Seville. He carries packed eternities into the dusk. As I pass through Customs, it is the hedgehog that smuggles me. My brooch bristles. Smuggling is translation. Between a subject and an object. Between an idea and reality. Between reality and a shadow. Between a pronoun and an imperative. It is—for those who are unable to let go—nesting in two places at once. It is a yearning for bilocation. Some Christians were adept at it. St. Anthony of Padua, St. Ambrose of Milan, St. Severus of Ravenna, and Padre Pio of Italy. Both translation and smuggling come from longing for presence. From a loss. They speak of insufficiency of one life, one language. Yet insufficiency to express what is ineffable saves us from idolatry. Contraband of Hoopoe utilizes, as “one of its guiding totems,” the hoopoe, described in the press release as “that bird of exile and return, which King Solomon sent to the Queen of Sheba to convert her to his faith. 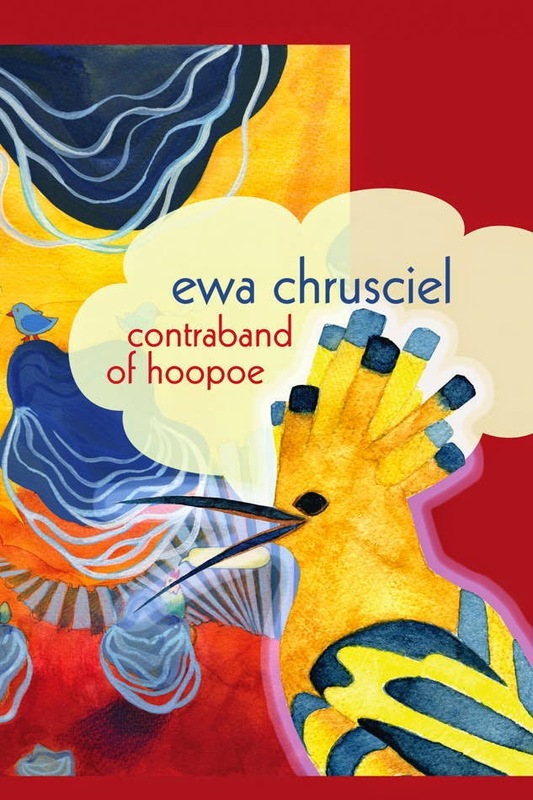 Under the aegis of this mythical bird, Chrusciel tracks a series of historical objects, undeclared beliefs and secret messages that immigrants throughout history have been sneaking through customs, past border checkpoints, and across the seas.” Constructed as equal parts poetry collection, historical essay, thesis and travel journal, this is a complex and thoughtful collection, and one I am very much impressed with.